On Saturday, spring had finally arrived. Girls came out in their miniskirts, boys in shorts. What a relief after this year's unending winter! However, what the meteorologists had warned us about came to pass; the thawing snow had changed to water rushing down from the hills into streams and rivers. People are being evacuated from flooded towns; horror of a flood like we had experienced a few years ago threatens several regions. Some people have not even had a chance to finish repairing their homes, damaged in the past floods. The post office on Sokolovska Street in Praha 8 is doing a fantastic job. It is where we take armfuls of magazines, calendars and letters and all the employees are so nice and willing to help. The municipal office in Praha 9 where I had to take care of a rather unpleasant business gave me a pleasant surprise. On the way there I thought of times past when a commission had to be summoned to resolve such a sensitive family problem. I would have had to stand at the stake to beg and explain. Not so today. A pleasant young clerk wrote down my claims, explained my rights, without posing any private questions. To make it short, she took care of me with a smile. I left that office, feeling like I was floating on air. The songwriter Jan Burian's great new CD "Divci Valka� has just come out. 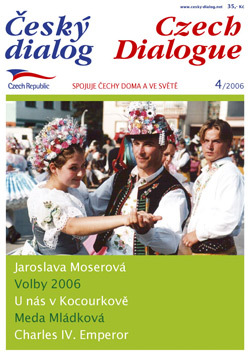 The Czech Association in Slovakia put out a different but also beautiful CD. The extremely talented Marie Sladkova from the Literary Academy has started working in our office. Our authors Misha Swinkels-Novakova, Jana Volfova, Lidka Lojdova, Ota Ulc, Bohuslav Hynek, Bohumil Tesarik, and other new and regular writers have, with the coming of spring, practically showered us with a multitude of interesting articles and even poetry. In the office, there's never a dull moment. The readers come to visit, send letters, lots of e-mails, what a joy! I could go on and on about all the happy things but, right in the midst of it dies our friend, the wonderful Jaroslava Moserova and our sun goes down in sadness. I've just gotten back from the funeral of this remarkable personality. In my mind I still can see the largest funeral hall in Strasnice decorated with flowers and wreaths and filled to capacity with grieving people, and there again in the grief and weeping I can see something positive. In the funeral oration we were reminded that Jaroslava Moserova was all of her life against the communists and that we should take on, her non- compromising attitude as her legacy. At present time when the Comrades are getting more and more incredibly bold and arrogant and use the socialists to climb higher and higher, it surely is a challenge for those present, and not only for them. So it's up to you to decide whether I have been positive or not. Most probably like April showers and sunshine, showers and sun.